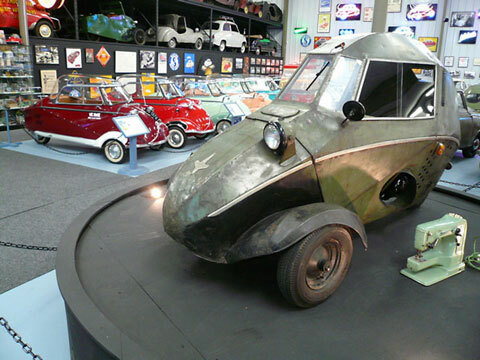 Although the Flitzer was the precursor to the Messerschmitt KR175, it was NOT built in the Messerschmitt Factory. Fritz Fend started building very primitive vehicles for people who had lost limbs during the war before he built his first vehicle. Conceived as a method of transportation for the disabled, Fend did not want the vehicles labeled as "for the disabled", but as a "car" that also appealed to the handicapped. The Fend Flitzer evolved from an invalid carriage with bicycle wheels and 38cc engine into this 100c Microcar with scooter wheels and a choice of open or enclosed bodywork. Eventually Fend took his design drawings to Regensburg, the home of his former employer; Willy Messerschmitt, whose factory, now that the war was over was now desperately looking for things to manufacture. Here the original Fend Flitzer designs were adapted, along with other designs that Fend had not produced to create the Messerschmitt KR175. Built between March 1949 and December 1951, Fend built 252 of these models. Today there are perhaps 4 known to survive. This is the only one in all original condition. Weight: 120 kg Electrics: 6V 3 Wheels: 4.00 x 10"